The signs we manufacture can be used for more than advertising and brand recognition. With our knowledge of substrates and fabrication, we can create a high-end display of virtually anything you need. Like any school, Mirman School for Highly Gifted Children benefits a lot from donations. To recognize those who had contributed to the growth of the school, Mirman School wanted some plaques made to be displayed at the school. Like the other exterior signs we did for them, they wanted to use metal. Metal signs are very versatile and are a great choice for outdoor signs because they can hold up well to weather and look great on a lot of exterior walls. Metal can be flat-cut, formed, or engraved depending on what type of sign you’re making, and there are many different finishes that you can choose from. 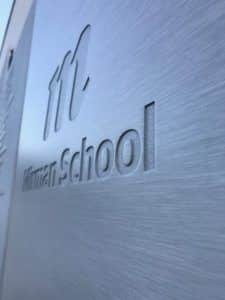 The three exterior signs we’ve done so far this year for Mirman School have all been metal-based, but each one has been a different style and were made to serve a different purpose. The metal plaques were large panels with either engraved or raised lettering for recognizing those who had donated to the school. There were to be a total of 4 panels of the same size and they were all 5/16″ thick. These were aluminum panels with a random orbital finish and a bead blasted background. The two panels that listed all of the donors had raised lettering and the other two had engraved lettering. We installed each plaque with spacers so they were 3/4″ off of the wall and each panel was offset from one another. The dimensional letters for the athletics department were flat-cut from 3/4″ thick aluminum. These letters had a clear anodized finish. Aside from changing the look of the metal, anodizing aluminum makes the material harder, more durable, and less likely to corrode. There were two signs made, one to identify the Athletics Field and another to identify the Athletics Building. These areas were also re-named to recognize families that had donated to the school. 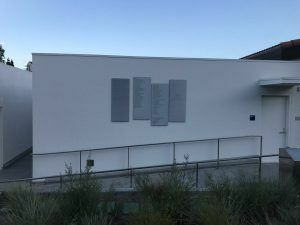 The main entrance sign was made to not only display the school’s logo for those entering but to also help people locate the school in the daytime and at nighttime by having an illuminated sign. These reverse-lit channel letters are individually formed and are hollow, as opposed to the dimensional letters we made which are flat-cut and solid letters. These channel letters are reverse-lit and have brushed aluminum faces. Aluminum is very versatile and can be used for many different forms of signage. No matter what you need us to make, you can rest assured that your sign will be well-made and look good.